The traditional naval ‘cat’ was made of a thick piece of rope which had been unwound into its nine constituent strands, and knotted. It’s pretty hard to knot Cat 5, which usually bends in a radius 4 times its width. However, we can add modular connectors. 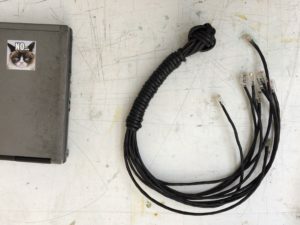 To make this a really painful piece of kit, we’ll leave the protective boots off the connectors, but if you’re going to want to soften the blows, then remember to put a pair of boots onto each length of wire before you crimp the ends. 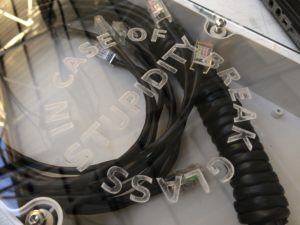 You will need a scalpel or Stanley knife, side clippers, a Cat 5 crimp tool, cable, and modular connectors. Most crimp tools have a cutter on them, but we’ll need the side cutters to tidy up the last end of cable anyhow, and they are less unwieldy than the whole big tool. Optionally, you may want a flat screwdriver or awl to help tighten the big end knot. First, grab several lengths of cable. Four will be about the length of your full two-arm span, and the fifth should be at least three times that, depending on how long you want your handle to be. The crimp tool cutters are ideal for cutting these. I have chosen black, but there is no reason you shouldn’t use another colour, or a mix of colours. You will definitely want see-through modular connectors, as you need to see inside the block while you are building it. Start with the shorter pieces of wire, and add ends to each. The outer coloured layer is softer than the inside. Strip off about half an inch of outer cable by scoring lightly around with a sharp knife. It should then pull off easily. 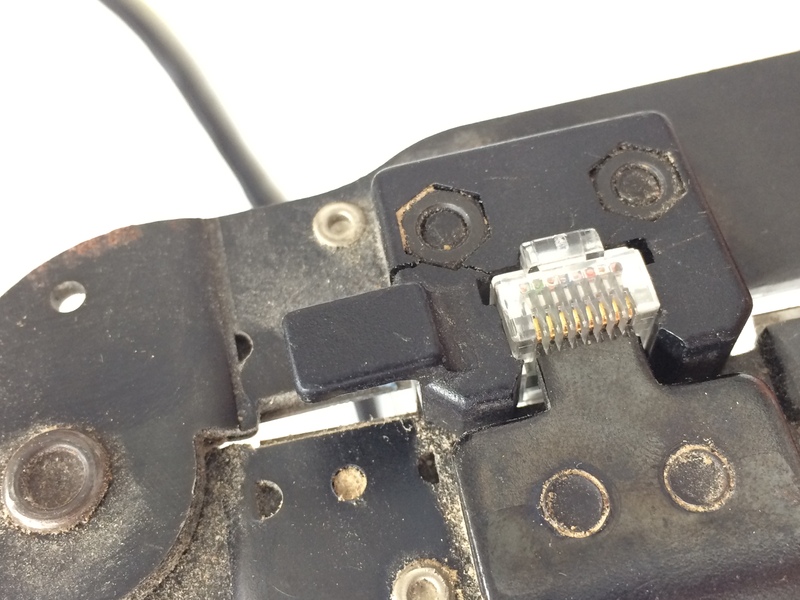 If there is fibre inside the cable, trim that off. Untwist the wire pairs inside, and flatten them into the order in the photo. (This is not the only order, but it’s one standard to prevent cross-talk.) 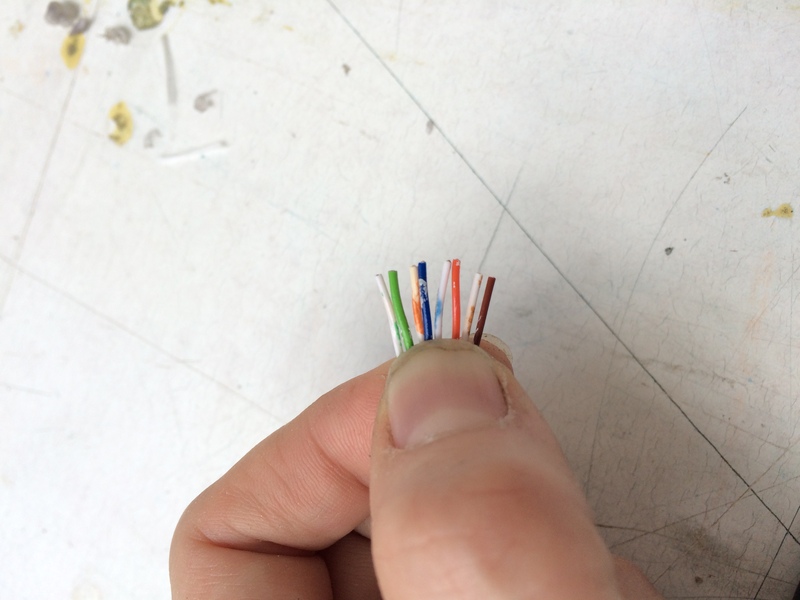 This order, T568A Wiring, is Green-and-White, Green, Orange-and-White, Blue, Blue-and-White, Orange, Brown-and-White, Brown. The wires are stiff, but you can flex them forward and back in the fan, and that will help to straighten them. There is no need to strip them, because the crimp tool will punch metal through to the inner wires. At this point, the wire lengths will be different. Once all of the wires are aligned and held easily in one hand, trim the ends. 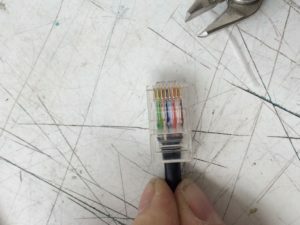 You’ll want to push the whole wire as far as it goes into the connector, so the ends need to be the same length. If the wires are still trying to escape you, bend them back and forth gently until they ease into their new positions, before clipping. Take off as little as you can in squaring up, because you’re going to need much of that half inch inside the connector. Now take the connector and push it gently over the coloured wires. There are channels inside the connector and each wire will, with only a little wiggling, go into a single channel. I’ve found it’s best to angle them very slightly, so they go in one at a time, but as long as they are all straight you shouldn’t have a problem. Push in gently at first, but make sure the whole wire beds down to the end, for the best electrical connection. Then push the coloured wire sheath up into the plastic housing. This will also be crimped down, but needs to be shifted up a little around the inner wires. The cable will bed down into the crimp tool. Here you can see the ridges on the tool are pushing down on the metal that is part of the connector. That forces the metal into the inner wires, right through their coloured sheathing. If you have a crimp tool with a ratchet on, this is much easier. Otherwise, you’ll need a little dexterity in with your strength. 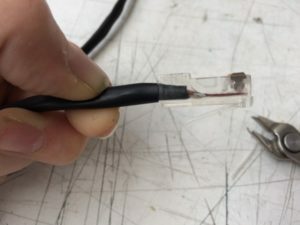 Keep pushing the outer soft sheath into the connector while you close the crimp tool as far as it will go. The connector below has not yet been crimped, but shows how far the sheath needs to be for a decent bite. 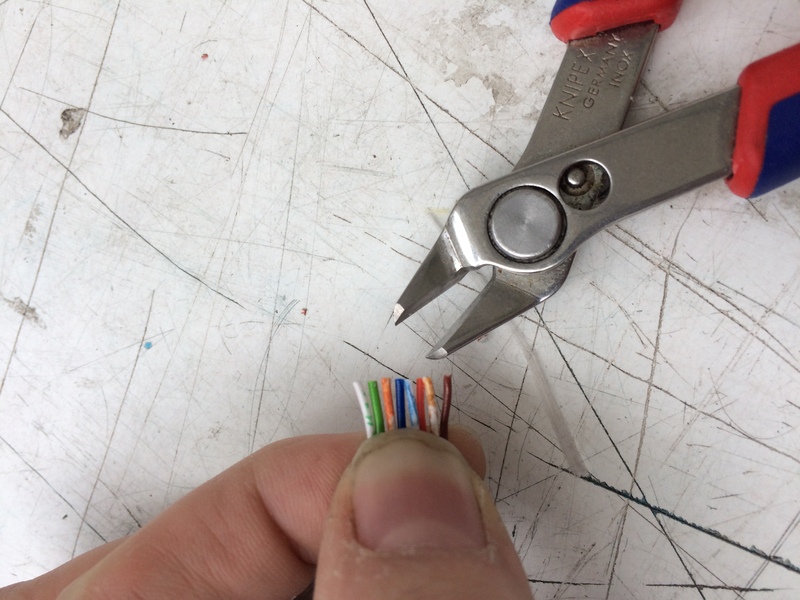 Once you have the crimps finished for the shorter pieces, take the longer piece of Cat 5 and put a decorative knot most of the way towards one end. Leave one length that we will crimp later. A monkey’s fist knot is ideal. Start this by winding the wire three times around your fingers. You want it to be loose. Take the winding off your fingers and, again loosely, run the wire around the winding three times, to make a cross shape. Now feed the end inside your first loop, but outside your second loop, three times. Image below is courtesy of Wikipedia. Tighten it slowly and carefully, by feeding the wire through the whole knot, repeatedly. Don’t try to close it all at once, or the knot will become shapeless, and don’t close it all the way yet. Get it most of the way closed, and arrange it as a rounded ball. As a purely decorative knot it can take a centre to ensure a spherical shape, but we’re going to rely on the strength of the cable to hold the shape for us. Before you tighten the knot completely, feed the four shorter lengths of cable through it so they sit centrally. Arrange the shorter end of the uncrimped piece so that it is as long as the other tails, feeding the spare wire through the knot, and the reshaping it. The long bit, the working end, should still be considerably longer than the rest. Take a hitch around the base of the whip with the working end, and then wind it loosely around the nine other strands, to make a handle. Take another hitch at the end then feed the working end back down as a tenth strand, inside the windings, and then tighten them until everything is held snug. As with the monkey fist knot, you may have to tighten and move the wires repeatedly, but the end result will be a tight, comfortable handle. Use the side clippers to take off any extra length from the working end once you’ve tightened it. Put on the last connector, and you’re done. I made a presentation case for my Cat out of an ABS wall box and a laser cut front with hex bolts, but equally you could add a clip to the decorative knot, or have the whip unadorned. Just remember that if you do put pressure on the knot, you’ll be deforming it, as there was no room for an inner core once we passed the wire through it. If you do decide to add a core, let me know in the comments how that went, so I can update this post. Posted on 4th December 2016 19th February 2017 Categories Coding, Software and FirmwareTags failing is fun, fun with arch linux, fun with code, fun with cplusplus, fun with makefiles, making, things I do because I'm learning2 Comments on C++: Cake or Death? The gilded cannonball is ready. It’s so cool I made myself one too, to carry on me. Artists need gold-leafed 6lb cast iron spheres so often! This is not about cannonball gilding at all. I showed a friend a photo from the process of making his Christmas Present and he said he was in need of a cannonball, so that’s my code name for this. I have pictures of it being polished as well. But, as there’s a chance he might see this before Christmas, let me just say that the gilding powder picture came out badly. Well, those lead screws didn’t need to be that long anyway. And use the pulley grub screws to hold everything together against the backlash. It’ll be fiiiiiiine. If necessary, I can put the solid block of aluminium on the other side of the metal it’s attached to right now, and that’ll tighten things up, although I’d need to take some more length off the lead screws. That could never go wrong. Today I bought a new HDMI screen and connected everything up. I now have a working Rasbian computer with wireless mouse and keyboard. I’m well chuffed. I’d like to do a lot more on it, like wire in the USB sockets on the top of the case, which isn’t horribly difficult. Right now, though, ZipPi is a functional, dedicated computer. It may be a Raspberry Pi 3 soon. 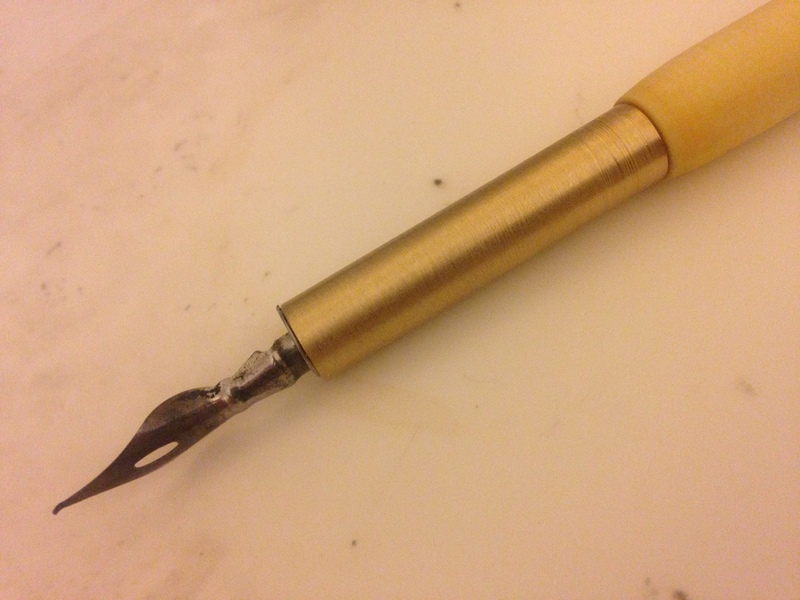 Making a better pen – obsession creeps in? I have blagged some hardwood from someone rebuilding their kitchen, and am going to make some proper blanks and dremel them down. Not in any way over-thinking this. Posted on 15th February 2016 Categories LifeTags fun with a band saw, fun with drills, making, making a pen, things I do at makespace, things I do because I'm boredLeave a comment on Making a better pen – obsession creeps in? I need to look up the relative prices of linear rail and V-Slot profile. Buying profile might be cheaper, despite having the T-slot already. If it is, I can still use some of what I’ve got, but things like the V slot C beam would solve a lot of my problems. I nabbed some more apple wood from the same tree/friend combo, and this time I used a Stanley knife to pare it down, which was much easier than the pocket knife, both in sharpness and in the shape of the handle. I went through the same process as before, but this time I formed the far end before I started sanding down the wood closer to the join, to make sure it stayed strong there. I also sanded the brass with the fine soft pad, and then I squeezed hot glue into the brass fitting. Then the ferrule wouldn’t fit, and I had to bang it in with a hammer, which meant I had to scurry for a hammer. However, nothing broke, and now I have a pen. It’s a snug fit for pen nibs, but I’m OK with that. I’ve bent the inner springs a little bit to help the fit, and it’s all good, and I have no problems. I’m pondering making a two part top, with bits that fit inside each other, so I can get rid of the need for steel. That’s a long way away, though. I’ve given it a coat of varnish, and I’ll give it a couple more. That’s to protect it against the horrible mess inside my pencil case, mostly. I’ll also make sure the join ends up full of varnish, so no moisture penetrates.